The chance to finish the season in the AHL with the Milwaukee Admirals is key to Austin Watson's long-term progression from junior star to big-time pro. 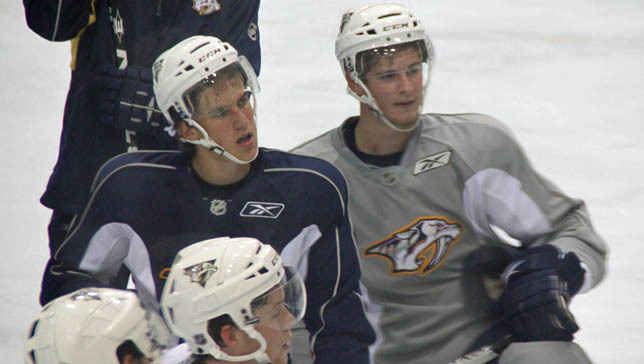 "Draft is the first step, coming to our conditioning camp and integrating into the Predators system is two. Signing the first contract is three," Preds GM David Poile explained. "And then the next step is for him to get in to Milwaukee and see what it’s like to be a pro player; get in some games and see how he can adjust to the pro level. It is continual steps." The Preds have used late season additions to help ease the transition with several players in the past. It's all part of a regimen the Preds have had success with in the past. Jonathon Blum made the crossover two years ago and benefitted with a strong rookie campaign in the AHL last season. After wrapping up his collegiate career last year, Blake Geoffrion joined the Admirals for their playoff run, a major help in his success this season. "It’s clearly a big step. And players find out quickly about the speed and strength of the players in the American Hockey League," Preds GM David Poile said. "This end of season taste of the AHL, gets them more motivated, more focused as to the talents they have and the areas they need to improve. If the player can play games and help out in Milwaukee this year, that’s sort of a bonus in this situation. It’s more important for them to be there, take in the atmosphere and see how they compare to different players, see what the pro work ethic is like, what the pro preparation is like." "He'll be practicing against pros -- trying to crack a good lineup of pro players. (Milwaukee Head Coach) Lane Lambert will be saying, here’s what we’re doing today, here’s what I want you to get out of practice today, here’s what I want you to do after practice working with our AHL strength coach, here’s a player I’d like you to look at in terms of his style of play. It's a lot to learn, both on and off the ice, so to to get him exposed to it now, we find really helps down the road." Nashville, Tenn. (March 30, 2011) – Nashville Predators President of Hockey Operations/General Manager David Poile announced today that the club has signed 2010 first-round pick (18th overall) Austin Watson to a three-year entry level contract. Watson will spend the duration of the 2010-11 season with Milwaukee (AHL) on an Amateur Tryout Agreement.